Recently, FDA has adopted the principles of Quality-by-Design and promotes the use of pharmaceutical development information in original applications. 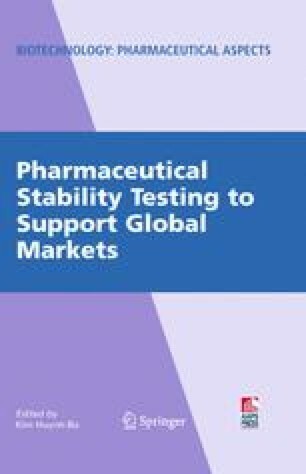 Stability studies occur in three phases in the life-cycle of a pharmaceutical product. They are: Stability studies during product development, stability studies that support a marketing application and stability studies that support post-approval changes. Quality-by-Design determines the stability studies conducted during product development. At the time of submission of an application, a package of stability data on the to-be-marketed product is combined with the knowledge gained during product development to establish a shelf-life for the drug product. After approval, routine stability data is collected to monitor product quality. When changes to the product formulation or its manufacturing occur, it may be recommended to the sponsor to obtain stability data to verify whether the change does not adversely affect the stability of the drug product. The views expressed in this chapter of the book are only of authors and do not necessarily reflect the policy of the U.S. Food and Drug Administration.